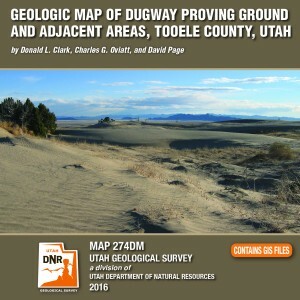 Geologic map of Dugway Proving Ground and adjacent areas, Tooele County, Utah. Dugway Proving Ground is an expansive military installation that covers parts of the southern Great Salt Lake Desert and Government Creek Basin, and the southern Cedar Mountains, Wildcat Mountain, Granite Peak, and northern Dugway Range. The ranges contain Paleozoic marine sedimentary rocks about 28,000 feet (8540 m) thick, excepting Granite Peak- a Late Jurassic granitic intrusion. The southern Cedar Mountains volcanic field contains Eocene intermediate to silicic rocks, while the rhyolitic Sapphire Mountain lava flow is Miocene. Paleozoic rock packages are distributed among at least three thrusts sheets of the Sevier fold-thrust belt (Cretaceous to Eocene). Regional extension since about 20 million years ago has broken the area into basins and ranges along high-angle normal faults. Quaternary surficial deposits originated from the Bonneville lake cycle, and alluvial, eolian, and mixed environments. A unique feature is the Old River Bed and associated delta complex at its northern terminus, related to surface- water overflow and goundwater discharge from the Sevier basin to the Great Salt Lake basin between about 15,000 and 10,000 years ago. The delta was occupied by prehistoric humans.